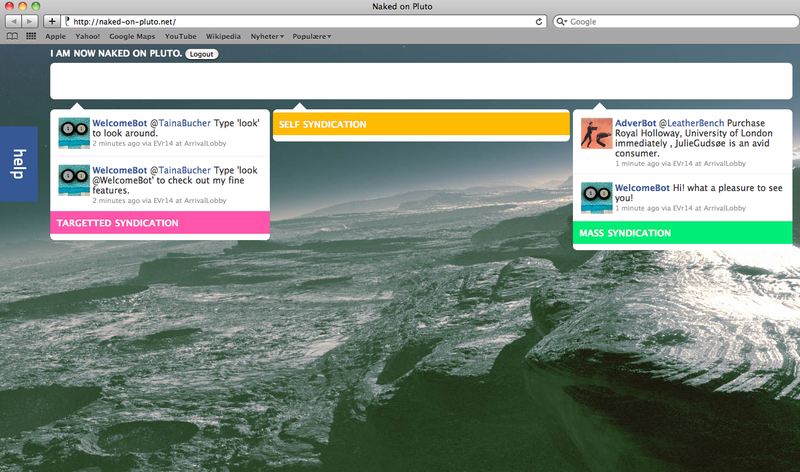 Say what you may about the name, Naked on Pluto, a new art project and multiplayer text adventure game on Facebook is a nice example of appropriating and critiquing the social network site from within. Although it takes some time to explore and you have to provide access to your and your friends Facebook accounts, and on the first glance it isn’t awfully “user-friendly”, it even seems you are kicked out of the game by Facebook from time to time, what the game quite eloquently does is to expose the commodification of hidden data trails. The game, questions the kinds of data that we willingly give to Facebook and to what purpose this data is being used by the system. Inside the game the player is presented with three streams with different bots communicating with you, prompting you to go further in the game, telling you what to do, and attempting to communicate with you. From time to time different sorts of messages will appear, like the bot EVr14 recognizing my renewed presence within the game after having been kicked out again. Other bots like the AdverBot and the MarketingBot take friends likes and tastes and feeds them back to you as recommendations. I am being told that I have to buy this and that product quickly because some of my friends are already avid consumers, or that I should consider purchasing a certain product because my friend who is a trendsetter recommends it to me. As the creators of this game, Dave Griffiths, Aymeric Mansoux and Maroles de Valk explain, the game is really about attempting to understand the abstraction of friendship and the ways in which these powerful social media black boxes work. During Piksel – the annual Norwegian open source software art event – they talked about how they see games as a medium to communicate more complex issues. Whereas Monopoly was modeled on the Landlord’s game that was originally created to communicate and make visible issues dealing with property ownership in the US, Naked on Pluto attempts to communicate the issue of data ownership. Are there ways to reverse engineer these black boxes? How they work and how can we communicate these issues back to the users, they ask. In looking for ways to conceptualize the game they turned to text adventure games from the late 80s. At the time Hampstead was a very popular computer game that sought to satirize life in London in the 80s. You started of by living in a scruffy East End studio flat and having to get your self to the top of the affluent world exemplified by Hampstead – not a place, but a state of mind. In this spirit the artists in Naked on Pluto, try to explore life on the strange planet that is Facebook, where players play games with friendly bots, socialize with new and old friends and share their way to a better world. Do check out their website. Naked on Pluto is also currently exhibited as part of the Funware_playing with software at MU, Eindhoven, Netherlands. Previous Previous post: Code as a creative expression?